For for a multi-modal transportation system to work well (one where people have the easy option to drive their cars, walk door-to-door, ride a bike or take public transportation), all the parts of the system need to work together to allow universal accessibility. A well designed area lets the individual choose their mode of transportation. 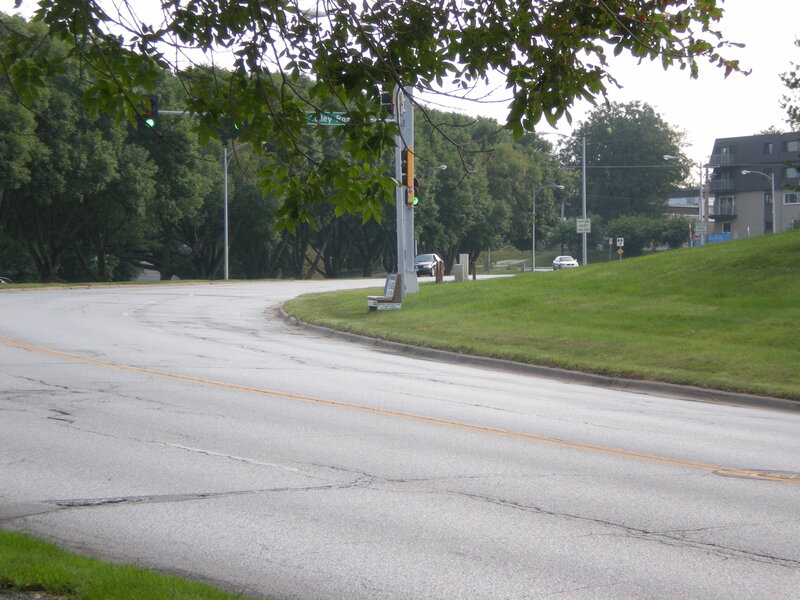 Poorly designed areas dictate — usually that you must drive a car. 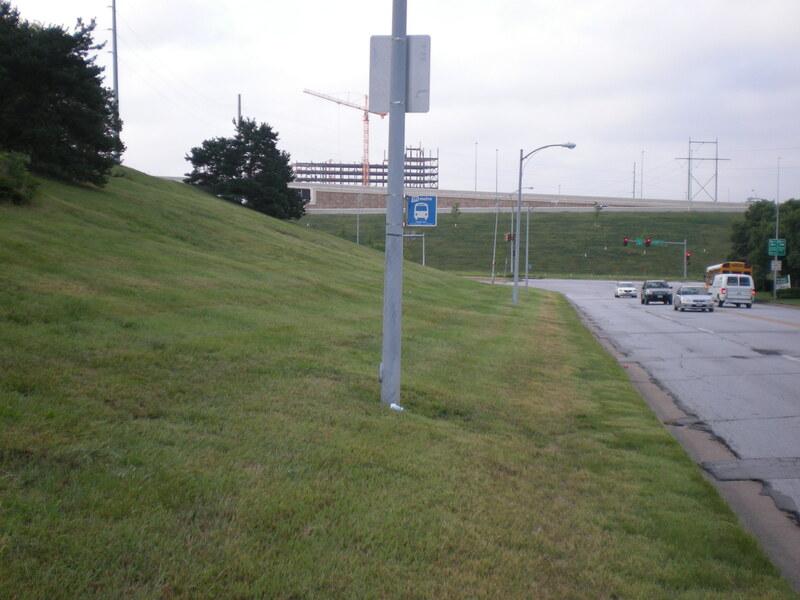 Today, we’re going to look at a particular poorly designed area, and highlight how one bus stop exemplifies the breakdown of transportation options. 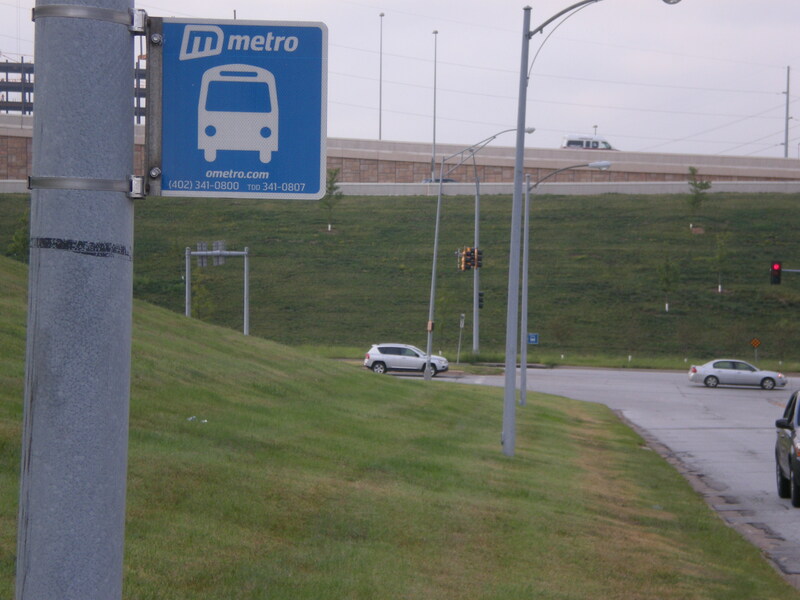 To begin, while we are looking at a bus stop, the purpose is not to criticize the transit authority of the city of Omaha, Metro. While the siting of this stop displays a disregard for all but the most able and nimble rider, Metro has a limited budget and does a decent job when considering Omaha’s per-capita expenditures for public transportation. That said, the total failure of this bus stop is a group effort between the city, the transit authority and the private property owners. This first image shows a bus stop for the north-bound Route 22 bus. This route is exclusively a commuter route developed to connect the Westroads Transit Center with the commercial parks at Miracle Hills and Old Mill with the last bus heading back to the barn by 6:30 p.m. This stop is most likely used at the end of the work day where riders can head back to the Westroads Transit Center and transfer to a home-bound bus. First Question: How do we get there? The likely population using this stop will come from the west side of 108th Avenue, the side adjacent to the stop. As you can see from the photos, there is no defined method, such as a cross walk, to convey bus riders from where they work, or where they are doing business, to where they will wait for a bus. Second Question: Now that we’re here, where do we stand? And “stand” is to be taken in the literal sense. The only option for this stop is standing. There is no bench for sitting. There is no sidewalk or ramp or concrete pad where someone in a wheeled conveyance (such as a mobility scooter or a wheel chair) would feel the stop also accommodates their ability to board a bus in a safe manner. The "bus stop" itself, facing south. 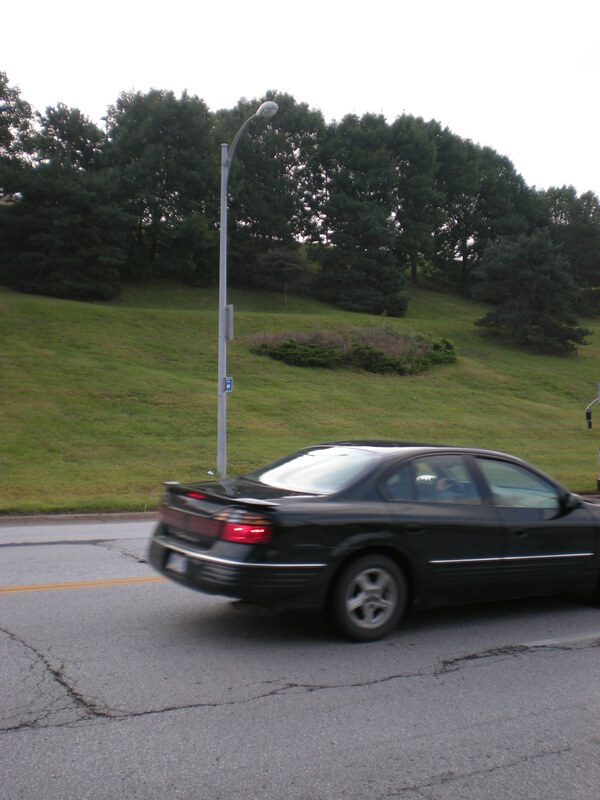 The raised roadway is Dodge Street. Consider also, what of poor weather? In a hard rain, does this stop become a mud pit? After a heavy snow, is there any hope of using this stop, or is it blocked by a berm of plowed snow? In an area with four seasons, this stop is not only difficult, it is impossible. Fear not. If you look at the full-size of the above photo, you will notice that where Metro lacks accommodation, they make up with frequency. No more than maybe 100 yards away is another bus stop. Because there is no sidewalk, no safe place to walk, no accommodation for weather, this overload of bus stops actually makes sense. If you can’t move your riders by other means, you must meet them where they are, huddled by the side of the road. Question 3: There is seriously nowhere to sit down? If you can brave the walk, there is a bench sitting in the grass up the road. Now, there isn’t technically a bus stop there (according to signage, or lack of), but I promise, most Metro drivers will still stop for you. In addition to the site-specific problems, consider that these stops are exclusively for initiated bus riders. The information stream is barely a trickle, and any information meant to bond the user to the transit system is drowned out by the clear message conveyed by the environment that the bus rider is neither welcome nor wanted in this part of town. Someone new to the system would have no idea what buses serve this stop, what destinations are accessible from this stop, or how frequently the bus serves the area. A characteristic to look for in good transportation design is connectivity. How do you get somewhere and, once there, where else can you go? Far from connected, these stops are hardly even islands of transit accessibility. They are more like sand bars that are as likely to be a problem as they are an asset to the flow of Omahans from here to there. I’m starting to see some positive changes. Nothing in the way of access improvements, but better signage. If you go from Crossroads to Midtown along Dodge, you’ll notice the old (2011) transfer stops are being replaced with new transfer stops (2013). Not a huge deal, but I think the new stops look twice as good and are much more professional, and thus are a step in the right direction. They are in the process of replacing the old transfer stops, so a mix of the old and new stops can be seen throughout various parts of the metro. Also, at the shelter on the SE corner of 42nd and Center, there is a map of the route that serves the stop. No matter how simple and old the idea of putting maps at stops is, this is a first in Omaha. Westroads and Benson Park transit centers were just improved, and North Omaha Transit Center is being reconstructed at the moment. Just thught I’d let it be known. A positive story about bus amenities improvements would be a nice read. Thanks for your comment and sharing good news! Let us know if you’d like to write a blog post about it. I suppose I might be able to do that. Send me an email so I can send it, and I can have it done within a few days.